Laminate Flooring Experts, Installers – Choose the Best Laminate Wood, Plank Floor HRM Family Flooring – Proudly serving the Newbury Park, CA area since 1984. Laminate flooring experts and installation. Let us help you choose the best, durable laminate floor for your home decorating project. Variety of laminate samples, styles colors. - HRM Family Flooring, Newbury Park, CA. The appealing nature of laminate flooring, combined with its ease of installation and care, has made laminates one of the fastest growing flooring trends. At HRM Family Flooring, our flooring experts can help you choose a laminate solution that suits your unique decorating needs. 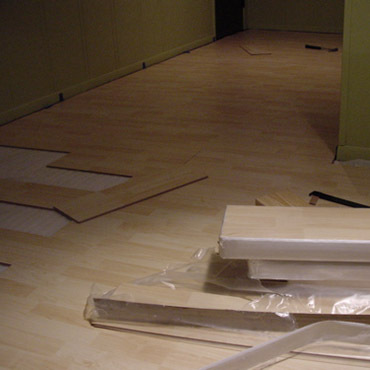 Laminate flooring started out as simply a cheaper flooring option for people who wanted the look of wood floors. Now, laminate flooring manufacturers have far surpassed the idea of mimicking wood styles and laminates are available in everything from traditional faux-oak planks to varieties that look like natural stone and ceramic tile. It’s true – the natural beauty of wood is timeless. But add a dog, a cat, and a couple of kids and that “timeless” beauty can turn into a maintenance headache. For today’s busy families whose homes tolerate virtual freeways of traffic, laminate flooring offers unmatched durability and easy maintenance. Cost is perhaps the most appealing attribute of laminate flooring. Not only are the laminate materials less expensive, but installation savings for a new floor are an extra bonus. As a less expensive option than wood or tile, laminate flooring can help people achieve the high-end style they’re looking for without the high-end price. Is a Laminate Floor Right for You? While installing and caring for laminate floors is simple, choosing the right laminate brand and style can be complicated. With a vast range of quality, warranties, and other options, consult an expert before you select your laminate floor. We’re here to help! Call us today at for your free consultation – we look forward to helping you find the perfect flooring solution. Professional installation also available! HRM Family Flooring – Proudly serving the Newbury Park, Camarillo, Thousand Oaks, West Lake Village, Agoura Hills & Oak Park CA area since 1984.